Harmonix is letting you start a band and rock the world on the go with Rock Band Unplugged, the PlayStation Portable spin-off that builds on the developer's rhythm game pedigree. We got a chance to go hands on with the PSP game at MTV's offices in Santa Monica, hoping that our Rock Band and Amplitude skills would transfer to the Sony platform's small screen. While an instrument-driven game may seem like an odd fit for the currently software-starved PSP, it feels like more of a natural complement to the library than one might think, thanks to Unplugged's strong gameplay. Here's what we thought of Rock Band Unplugged. 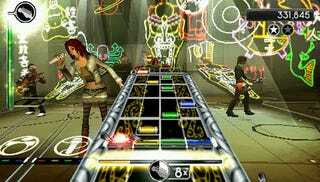 Rock Band Unplugged is the first portable entry in the Rock Band franchise, built for the PSP. If you've ever played Harmonix's Amplitude for the PlayStation 2, that's what Rock Band Unplugged is. If you haven't, Unplugged uses the PSP's D-pad and face buttons—specifically, up, left, triangle and circle—to match notes that scroll down the "highway," instead of dedicated instrument peripherals, with the PSP's L and R buttons allowing players to switch between vocal, guitar and drum tracks. Harmonix has announced that Rock Band Unplugged will ship with 41 songs, 9 of which are PSP exclusive. New songs can be downloaded via Unplugged's in-game music store, which should be refreshed every couple weeks. We watched Harmonix community man Alex Navarro work his way through the Jackson 5's "ABC", then through a quick tour of the game's announced modes. We played through two songs, The Police's "Message In A Bottle" and Alice In Chains' "Would?" both on Normal difficulty. The game looked mostly complete, despite the version we played not featuring the full 41 song strong track listing. We were played the game off of a PSP development kit, which was mostly stable. The game is due to ship June 9th in North America and Europe. No Multiplayer: There's really not much that Harmonix can do to add this, since it hasn't been announced, nor is it planned for Rock Band Unplugged. But the absence of multiplayer, something we've been spoiled by in the console versions and even the PlayStation 2 game Amplitude, is sorely missed. Less Schlock, More Rock: Purely personal preference, but some of the PSP exclusive tracks are a little lacking. I'm singling out things like 3 Doors Down's "Kryptonite" and Blink 182's "What's My Age Again?" While the Unplugged tracklisting is more than balanced out by new Alice In Chains and classics from The Who and Boston, the currently announced selection doesn't overexcited. Having to double dip for the PSP version of each track is going to make Rock Band Unplugged investment a little tougher to justify. More Pop, More Rock: Here's where I begin to contradict myself. The inclusion of "ABC" by The Jackson 5 is a great, unexpected addition. The return of Freezepop, this time in the core tracklisting of Unplugged, is also welcome. While personal tastes will obviously differ, the tracklisting does venture into the appreciably eclectic. Same Great Rock Band Feel In The Amplitude Style: Amplitude was a hell of a lot of fun. So is Rock Band Unplugged, which builds upon the established gameplay so under-appreciated in Harmonix's previous rhythm-based console efforts. The aesthetics of Rock Band are kept intact, with a capable World Tour mode, customizable band mates, and great information design that makes understanding the four across note highway a breeze. Customized Control Layouts: The default control scheme may just take some getting used to, but if you'd prefer a different button layout, you have the option. If going left and right on the D-pad, circle and square on the face buttons makes more sense, have at it. While it may seem like Rock Band Unplugged is devoid of what makes the game so fun in the first place—the instrument simulation, the multiplayer modes—the PSP version feels like a very capable entry. It's not a common thing to see quality rhythm games on the PSP, outside of a handful of titles, so the addition of Rock Band to the platform is a good portion of the appeal. Fortunately, the game seems to stand on its own, even without the Rock Band brand attached to it. The potential for extended play through downloadable content will likely make the investment worthwhile, especially when you don't have anyone to play the fully-fledged version of Rock Band to play with.